You know when the pros take the musette in the feed zone, then snag whatever they want and then toss it to the side for some fan to nab and cherish? You won't do that with this one. It's not a throwaway. Instead it's the perfect companion for beer runs, trips to the market, or as just another bag to grab when it's time to haul back overflow loot from Europe or wherever. 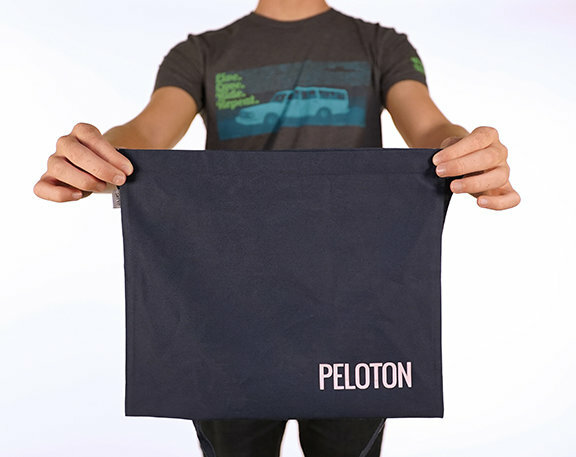 Made by our friends at SWRVE, it's sturdy and stylish with the PELOTON logo in pink on the front. The dark blue color will stand up in the wash and cover up any stains you may throw on it! The musette is topped off with a handy Velcro enclosure to keep gear safely inside.